The Rambling Blade, The Lawyer, The Bold Fisherman, The Dark Eyed Sailor, The Bush of Australia, The Female Drummer,The Bold Princess Royal, The Banks of Sweet Dundee, The Deserter, The Trees They Do Grow High, Two Jolly Butchers, The Loss of the Ramillies, The Handsome Cabin Boy, The Pretty Ploughboy, The Cunning Cobbler, The Devil & the Farmer's Wife, The British Man o'War, The Jolly Waggoner, The Rakish Young Fellow. I do realise that, as I've just finished producing the MT double CD of Walter Pardon, I might not be considered the best person to review something similar from 'the opposition'. I would counter by saying that I am always a scrupulously fair reviewer, that I probably now know as much about Walter's singing as most other people, and that I can't bear to pass this splendid CD on to anyone else! Moreover, our publication was always intended as a supplement to the other Walter Pardon songs already available on CD - principally this new Topic one - thus we're not really in competition here. So - first (or, most obvious) things first ... the Topic CD really does look a million dollars! I've always thought that The Art Surgery made a pretty good job of Topic's more recent sleeve designs, and John Haxby - working with one of Mike Yates' lovely photos - has really surpassed himself on this one. The booklet content is also good, and well presented. Mike Yates' notes are, it goes without saying, excellent, and contain some information intentionally omitted from the MT booklet to avoid too much overlap. I do have to say that I'm not keen on Topic's current habit of putting their song notes all together in one section (six pages here), rather than placing an individual note with the text of each song. The reader is forced to keep tuning back to the Song Notes section and hunting through it anew each time s/he wants some information about a particular text. It's also a pity, in retrospect, that the listing of eighteen Other Recordings on the booklet's final page does not contain any reference to the Musical Traditions CDs, since they do rather fill out the picture of Walter's repertoire. I suspect that the Topic booklet had already been printed by the time our track listing had been settled - large scale production schedules being so much less flexible than the small scale methods we employ. I admitted in the introduction to MT's Cyril Poacher CD that I had been slow to come round to appreciating what a fine singer he was - in fact, had not particularly liked his original Topic LP. Maturity (it was to be hoped) plus years of further listening - and most particularly, hours of forced concentration on the songs on Topic's Voice of the People series - had shown me the error of my ways. I was not alone in this, and many readers have subsequently made similar admissions regarding other singers whose recordings we've published ... and none more so than in the case of Walter Pardon. Typically, the comment goes "Well, I knew he was good, of course ... but I never realised just how good!" To such people I can now happily say "You ain't heard nothing, yet. Just wait 'til you hear the first track on the new Topic one!" Walter told Peter Bellamy in 1974 "My favourite of the songs is The Rambling Blade. I've heard other versions of it on the wireless, but I like this one the best." - though this is not mentioned in the booklet notes. Whether you share his opinion of the virtues of this version is neither here nor there - if this isn't Walter's best performance of any song of this type, I don't know what is! (sound clip) I've listened to rather a lot of his singing over the past six months and not heard better. Everything he does to a song is here: the extended lines; variable tune and rhythm; lengthened pauses between lines; exquisite timing; clarity, musicality ... all displayed to perfection, and all subjugated to the supreme task of telling the story. At then end of it, you'll know exactly why it was his favourite song, you'll agree with him entirely, and, I'm sorry to say that if you're like me, you'll have no patience at all with Mike Yates' lament in the notes that it doesn't include the line 'Taken I was by that lick-spittle crew'. However, I'm not sure that it was a wise decision to put this song at track 1, since the rest of the CD is set a standard that it struggles to live up to - every time I hear a particularly good song or performance I'm tempted to skip back to The Rambling Blade to check on my first impression! In fairness to the other 18 songs presented here, I should point out that this happens pretty regularly, as many of them are real crackers - but for me the first is still the best. Roly brown has done such a good and complete job of analysing Walter's singing style and the techniques he uses that there seems little point in my trying to do the same here - even if I considered myself competent. Suffice it to say that everything here is superbly sung (sound clip - The Lawyer). Indeed, it would be a surprise if this were not the case, given that Walter was an extremely consistent performer and that Topic had the choice of pretty-well everything he ever recorded except for the Bulmer-owned Leader tracks. In a way, their selection of 19 songs which Cecil Sharp would have deemed folksongs (though he would have found the frankness of The Bush of Australia rather hard to take), is my only disappointment with this CD. Perhaps as a result of listening to so many of Walter's 'other' songs in the preparation of the MT records, I find myself yearning for one or two of them to break up the monotony of relentless 'folk classics'. OK - so I'm too hard to please! Track 5 is not a song - instead, it's 1 minute and 40 seconds of Walter talking about 'song ownership' within his family and the wider community. This is delightful stuff, and it's interesting to hear that his speaking voice is quite unlike his singing one. For a reason that defies understanding, a transcription of this track is not included among the transcriptions of all the song texts. Still, readers can find most of it in the 'In His Own Words' section of the MT double CD's booklet notes, also reproduced in these pages. 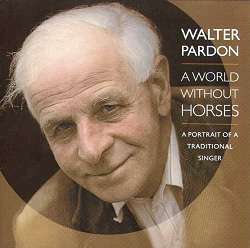 Walter Pardon must be England's most recorded singer, certainly one of her best, and almost all of his recorded songs are now available on CD (84 tracks, I think). If you're not already a fan, you really owe it to yourself to have a listen to him again - to realise, as I did, just what you've been missing. This present CD would seem to be an excellent place to start.